BuyFishfinders.com offers great deals on Humminbird, Lowrance and Garmin fishfinders, GPS, side imaging, down imaging, sonars, nuvi navigation and chartplotters. Our Other Sections links and site info has moved to the About Us page. You can also check out the site layout on the Site Map or try the Site Search page if you like. Lots of fishing and outdoor news available by section here including Tournament News, Conservation (including legislation and environmental news) and Amazon Peacock Bass Fishing on our exotic side. Questions or comments about anything? Contact Us or post on the Bass Fishing Forum. 74th Ultimate Sport Show is Here! Dobson and Greene Break 30 Pounds on Lake St. Clair! Ultimate Sport Show Tour Dates Posted! The day started out well. With air temps in the lower 40s, the lake was flat calm. Dan and I had not expected that. The wind would pick up later in the morning and would make it feel much cooler than the predicted high of mid 50s. I wanted to share a video I shot out here during the R & B Bass Circuit Classic October 6out of the Detroit River. I had a good day close to Mitchell's Bay. Unfortunately, it only lasted 1 day as it got muddy over night. The best bass fisherman in the world will make a special appearance at the 2019 Ultimate Fishing Show Detroit on Friday, January 11 only. 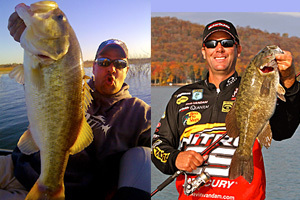 Both of Michigan's most famous bass anglers Mark Zona and Kevin VanDam return Friday, January 11 to the 2019 Ultimate Fishing Show-Detroit for seminars and events. The Ultimate Fishing Show runs Thursday, January 10 through Sunday, January 13. More details: KVD, Zona Headline 2019 Ultimate Fishing Show. Mexico Bass Fishing – The Adventure of a Lifetime! Need quality, affordable website design or web hosting? Use us! Check our complete line of Internet services at Angler Hosting! Whether you need a new website or your old site modernized, we can do it! We can socialize it for you and create a website you can update yourself too! » E.A.R.S. 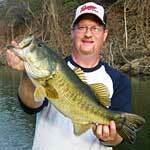 Sun Gear joins GreatLakesBass as Sponsor Advertiser! » NEW Lake St Clair No Secrets Volume 4! PLUS Volume 3 back in Stock!! » Great news! Lake St. Clair GPS Marked Maps are back in stock! » 2KJIGS.COM Grand Opening of NEW Retail Store! - Mexico Giant Bass Fishing!